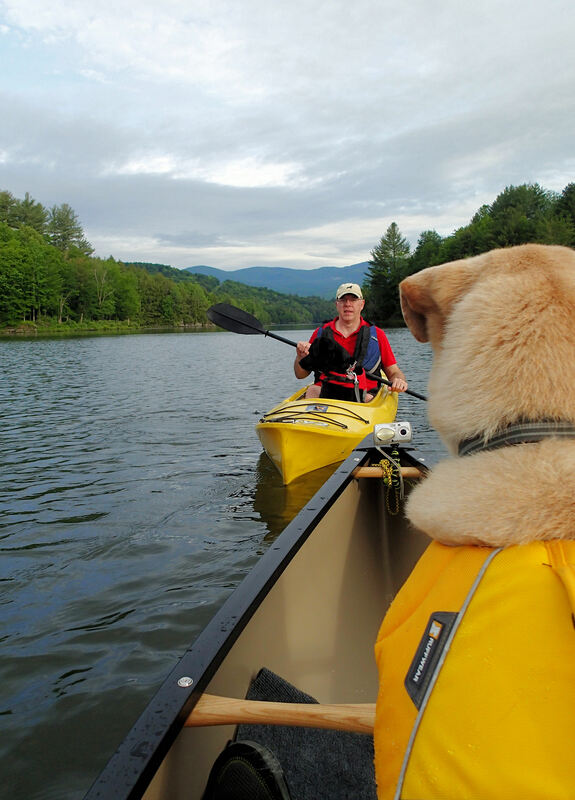 “Everyone must believe in something.I believe I’ll go canoeing” Henry David Thoreau | Vermont Paddle Pups! It is fortuitous that we had more canoeing than hiking planned for June….had we “believed in going hiking”, we would have been sorely disappointed this month. After a lovely, warm, dry month of May, June has arrived with massive amounts of rain. Nearly 7 inches have fallen in the first 3 weeks of the month, leaving trails sodden, muddy, dangerous, and in some cases closed. 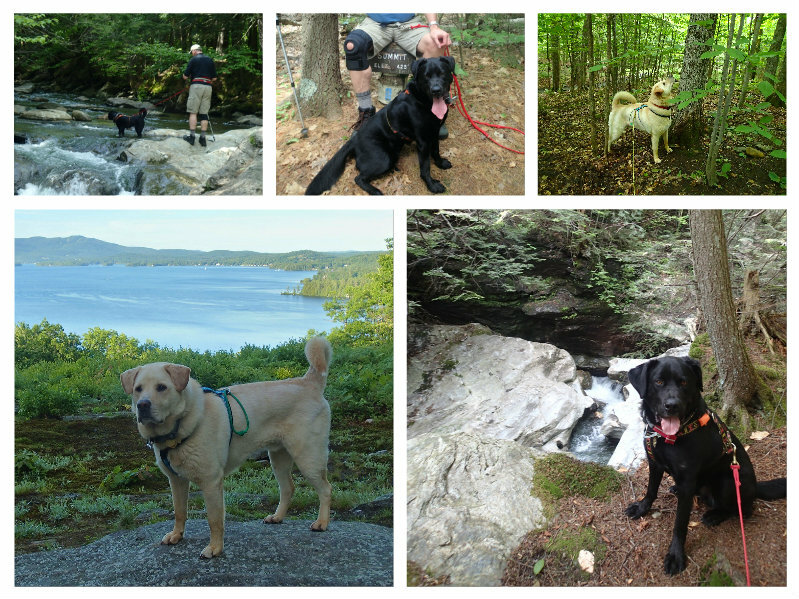 We have managed to utilize our local trail networks, at lower elevations, for occasional short, muddy, and buggy hikes. However, our sunrise summit hikes will have to wait until things are a bit drier…. Despite the frequent deluges, the paddling has been consistently fine….we have had quite a few day trips, including more practice with the solo canoe, and with the kayak. We now have the materials and hardware for our DIY double boat rooftop rack, but we just have to get around to actually constructing it! Our “big” trip for June had a bit of a different tone to it…we have traditionally avoided river paddling, because, quite frankly, we do not enjoy paddling uphill, and the logistics of shuttling cars and boats, along with 2 dogs, has seemed a bit intimidating. However, at our Friends of Waterbury Reservoir season opening event, I was chatting with Willem Lange–he suggested we look into the Connecticut River Paddlers Trail. So we did! Wilgus State Park is one of the smaller parks in Vermont…we reserved a lean-to, since car-camping is a luxury for us, and we decided to enjoy the extra room afforded my such accommodations. Located right on the Connecticut River, this park is a favorite among paddlers and fisherman. We found it very clean, orderly, and with a friendly staff. We did encounter one group that let their Golden Retriever run loose, in direct violation of park rules. In a very polite ( surprisingly!) manner, I did remind her that we had the great privilege to be allowed to take our dogs to the park, and if folks break the rules, we could lose that right…she had no answer. And so we had a great time camping (despite some rain)…we managed to put in at a very steep and slippery launch site (one of us nearly slipped into the river), and we quietly paddled beneath the Cornish-Windsor Covered Bridge, the longest covered bridge in the US. We briefly paddled over a gravel bar, but never actually bottomed out…our trip was only about 8 miles, and was a great introduction to paddling on this moving flat water, very wide river. After a successful take-out, and a quick nap, we made a short, but steep hike up a pinnacle allowing us to overlook the river…and early the next morning, we crossed the river to paddle a lake that had been on our radar for a while. We are excited about returning to the river, once fall and its brilliant colors arrive! 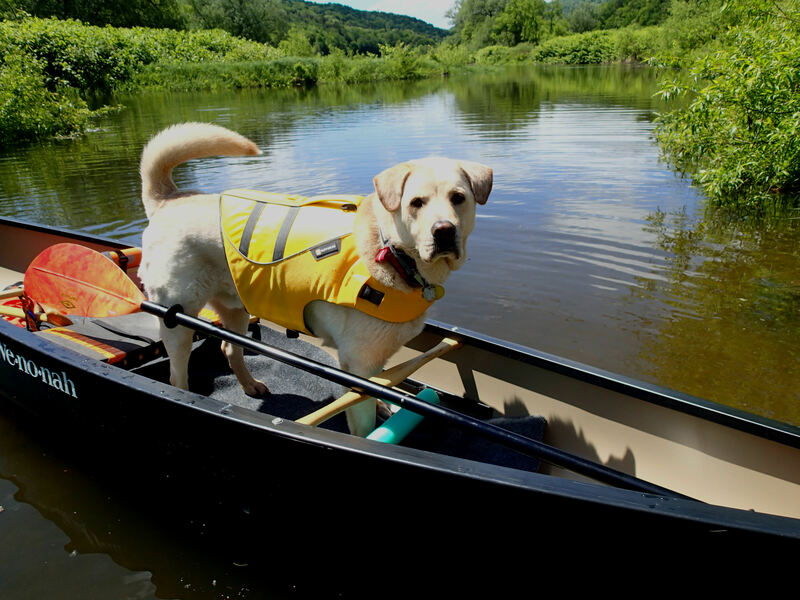 We’ve been giving the Ruffwear Float coat a good workout, with all this canoeing! Plans for this week include taking Griff for a swim while wearing the coat, and documenting this splashy adventure for the review I will write…. 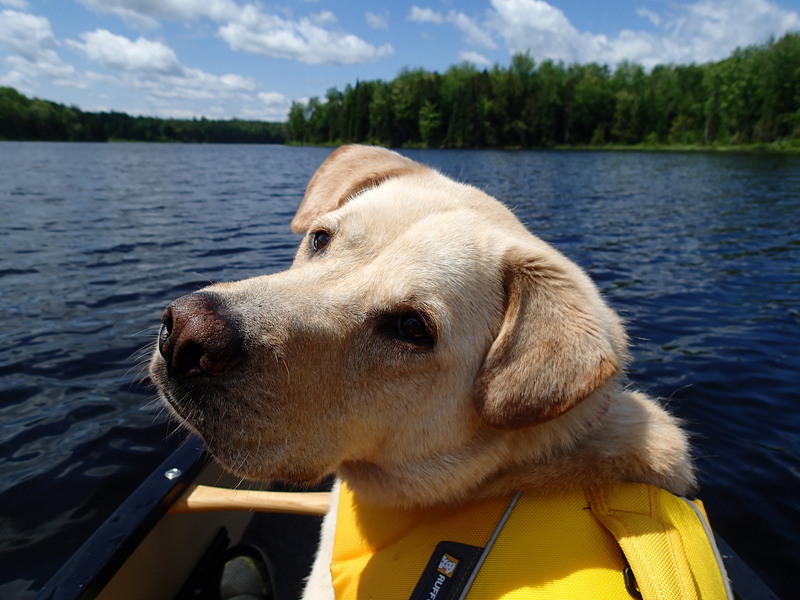 http://backcountryk9.com/ did publish a brief article I wrote for their adventure dog blog…it is a basic primer that shares some of the lessons we learned from introducing our dogs to canoeing. 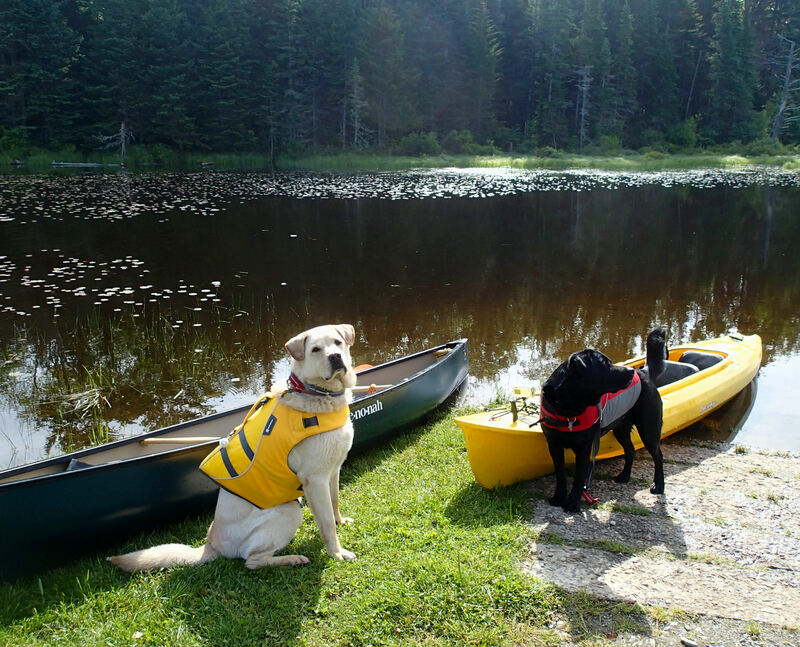 We are pleased that our dogs can hopefully encourage others to give K9 canoeing a try. Hmmm…14 more days in June..wonder how much more canoeing we can get in before July? Have a great summer of Safe and Fun paddling…that’s certainly our plan! 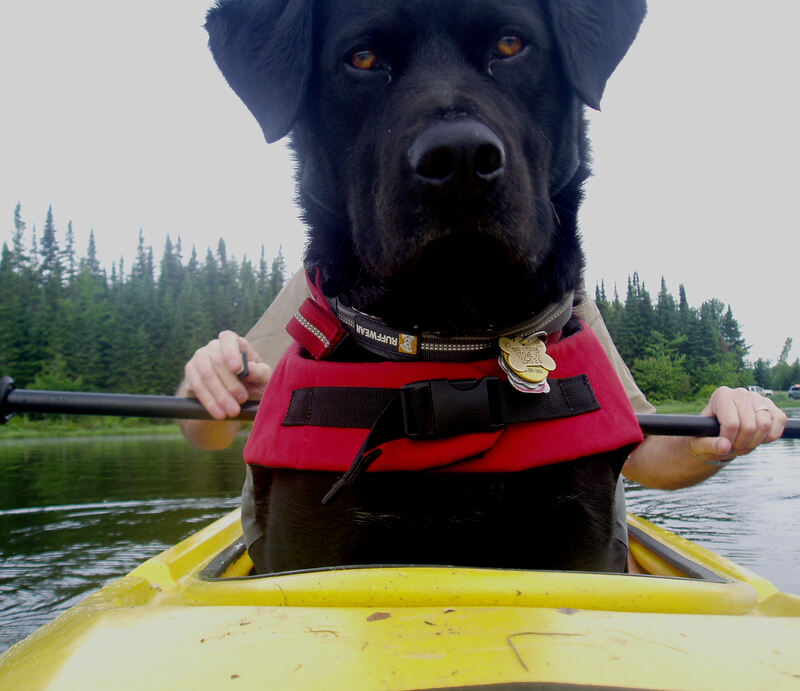 Oz loves going canoeing and camping with us. I think he finds paddling down the river just as relaxing as we do. I hate to see people not following the rules…and a 10 foot lead?!? That’s a lot. Here in Florida, dogs must be on a lead no longer than 6 feet. It’s people who do not follow the rules who ruin it for the rest of us that want to bring our dogs with us. Glad you spoke up to that dog person at the park. A few of my favorite dog friendly parks are no longer dog friendly because people didn’t obey the rules. Also pleased to hear you didn’t pass up the river trip because of the extra logistics. The bike can be really helpful. Since we didn’t own a car for many years, we’e gotten pretty good at rigging up ways to transport bulky items by bike (a 30 foot ladder, Christmas trees, etc), although never our kayaks. But I’m sure, with some ingenuity, you could leave a bike and cart at your take out spot to get the boats home.